Overactive thyroid or taking supplemental thyroid hormone dramatically increases the risk for macular degeneration, an eye disease that robs individuals of their central vision used for reading, driving, etc. There is no effective cure or therapy for the main form of the disease, though dietary supplements (AREDS Formula) weakly slow down its progression. A Dutch study in 2015 on thyroid hormone and AMD came to the same conclusion. 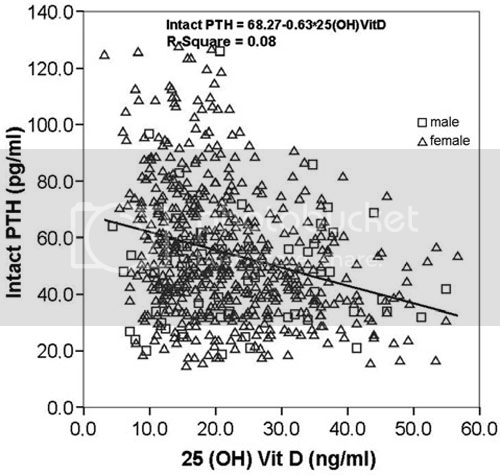 here we see how people with higher vitamin D levels approaching the natural 50ng/ml level have naturally lower PTH levels than people who have lower vitamin D status. Indigenous peoples, living near naked, outdoor lives, under the sun reach 25(OH)D around this point so whether we want to enable naturally vitamin d breastmilk, prevent cancer, reduce diabetes incidence, delay the onset of dementia, maintain optimal immune function, be in the optimum position to resolve inflammation to do any or all of these functions we need a reserve of bioavailable cholecalciferol readily accessible. If doing so also reduces the pressure on the parathyroid then why may it work overtime 24/7? I think we are at cross purposes here, the study about AMD was talking about the main thyroid not the parathyroid. In conclusion, this meta-analysis provides evidence that high 25OHD concentrations may be protective against AMD, and that 25OHD concentrations below 50nmol/L are associated with late AMD.